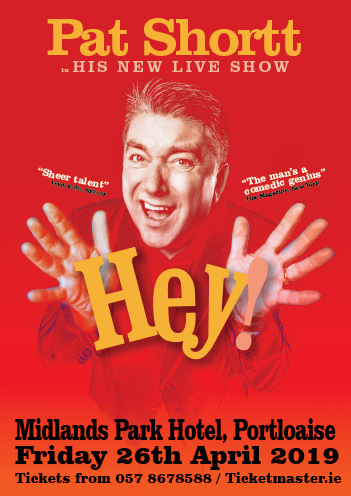 Following the sell-out successes of ‘The Hall’, ‘Selfie’ and ‘How’s Tings?’ and fresh from starring roles in the hit play ‘A Skull In Connemara’ and the film ‘The Belly of The Whale’, Ireland’s best loved comedian takes to the road with his latest quirky look at Irish life. Pat is hugely excited about coming back to The Midlands Hotel Portloaise as any show he has done here has always been a rip roaring affair and full of great fun and antics. Featuring brand new material and sketches, Hey! is a rogue’s gallery of odd ball characters, bizarre situations and even a song or two. Hey! You have been warned! A show not to be missed at the Midlands Park Hotel, Portlaoise on Friday, April 26. Check out the Leinster Express facebook page for an exclusive opportunity to win a pair of tickets to the show.